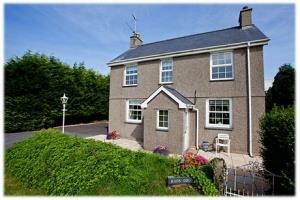 Rhos Ddu Self-cateringA lovely traditional Welsh cottage in an idyllic peaceful location. Set at the end of a short private tarmaced drive, next to Rhos Wen Cottage, surrounded by acres of rolling farmland (some being SSSI) with lovely walks from the garden gate. Over the garden fence you'll see some Welsh Hil Sheep grazing in the Winter and friendly cattle in the Summer. Accommodation - 2 Bedrooms sleeping 4 plus cot (+ 1 with folding bed by request). All bed linen provided and beds made up ready for arrival. Master Bedroom En-suite with Luxury Twin Shower/Steam Cabin with body jets - Antique Brass & Iron Four Poster Bed with Drapes, Bedside Tables, Chest of Drawers and Wardrobe. Hair dryer. Second Bedroom with Double Bed, and Antique Pine Bedroom Suite. Bathroom with white suite, electric shower over six jet Whirlpool Bath and warm Towel Rail. Entrance Porch with Coat/Hat Stand. Kitchen/Diner with granite worktops and Breakfast Bar - fully fitted with Electric Oven, Hob, Microwave, Fridge, Kettle, Toaster, Coffee Maker, Quality Stainless Steel Pots & Pans, Portmeirion Dinner/Tea Ware and a good supply of Cutlery and Crockery. Dining Area with table and chairs. Sitting Room with a Victorian pewter fire place and grate (sorry, not in use), an electric coal/log effect stove. Three piece suite, Digital t.v, DVD player, video, radio/CD Player. Utility Room with Washer/dryer, Freezer, Iron and Ironing Board, storage space. Combi boiler. Outside a large patio area to the front and back with barbecue, a very private, safe lawned area with garden furniture and rotary clothes line. Lockable garden shed for bikes and storage. Small gate to the field in front of the cottage and fishing and shooting on ajoining farmland by arrangement. Parking for 2 cars. A lovely traditional Welsh cottage in an idyllic peaceful location. Set at the end of a short private tarmaced drive, next to Rhos Wen Cottage, surrounded by acres of rolling farmland (some being SSSI) with lovely walks from the garden gate. Over the garden fence you'll see some Welsh Hil Sheep grazing in the Winter and friendly cattle in the Summer. Heating is by oil central heating on a timer with a radiator in each room. All electricity is by meter reading and is charged for at the end of your stay. Head onto the A487 towards Porthmadog . half a mile past Brincir village (just past "The Goat Inn" (on the left)) turn right (signposted Criccieth, B4411) . After one mile turn right onto a single track road, signposted "Ynys". Use the provided map to find the cottage you require. Head onto the A487 towards Caernafon . After 6 miles turn left onto the B4411, signposted Criccieth After one mile turn right onto a single track road, signposted "Ynys". Use the provided map to find the cottage you require. Turn onto the B4411 (in the center of Criccieth) . After 3 miles turn left onto a single track road, signposted "Ynys". Use the provided map to find the cottage you require. Should you have any problems finding us, please do not hesitate to contact Anwen on her mobile ( 0776 986 4642), she will be only glad to help in guiding you to your destination.